Welcome to Sir Alex Reborn, a Football Manager series where we put a 32-year-old Alex Ferguson into FM18 to see how his career would turn out if he had his time again. Ferguson began his managerial career aged 32 with East Stirlingshire – this is where we’ll begin our FM experiment. The setup of this experiment was explained in the last part, do go back and read it here if you would like to know exactly how we’ve edited the database by adding Fergie. This part will look at Ferguson’s first two years as a manager. Let’s get started. 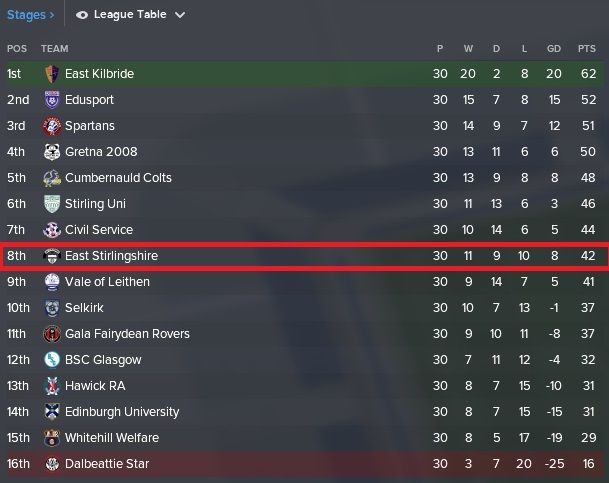 East Stirlingshire finished in 8th position in Ferguson’s first season in charge. Considering that they were predicted to finish in fourth, this will be seen as a poor season for the young Scot. East Stirlingshire reached the second round of the IRN-BRU Cup after beating Buckie Thistle on penalties. They came up against Peterhead where they lost 2-0. Ferguson fared better in the South Challenge Cup. His team reached the semi-finals where they lost to fellow Lowland League side Cumbernauld Colts on penalties. In the Scottish Cup East Stirlingshire were drawn against St Mirren in the 3rd Round. The Championship side won the game 3-0, as expected. The Lowland Cup takes place after the Lowland League is completed and East Stirlingshire made it to the Quarter-Final (the round that follows the first) where they lost to Gala Fairydean Rovers. A much improved season from East Stirlingshire saw them finish in 3rd place in the Lowland League. 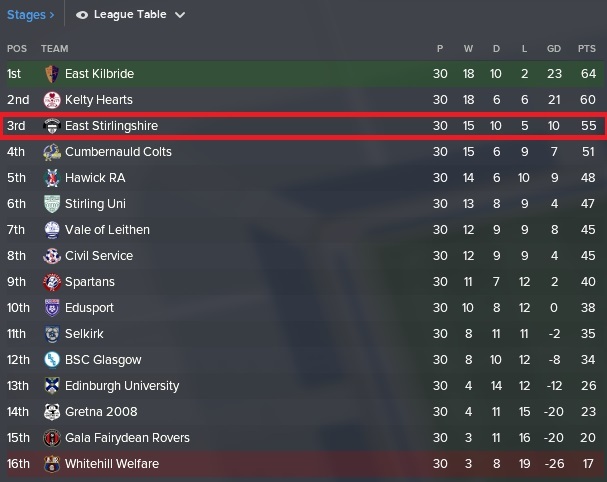 They were nine points behind eventual winners East Kilbride which shows that they’ve still got a little way to go to win promotion. Ferguson won’t be happy with the performance of his side in this years South Challenge Cup as they fell at the first hurdle, losing to Edinburgh University in the 2nd Round. No big tie this year in the Scottish Cup. East Stirlingshire only reached the second round as they were beaten over two legs by Kelty Hearts. Again Ferguson’s side reached the Quarter Final of the Lowland Cup but fell short, losing to Hawick RA. Alex Ferguson only managed 17 games for East Stirlingshire in his real-life career. He won 9 of them with a win percentage of 53. In FM Fergie has now managed 78 games for his club, winning 44% of them. He’ll be disappointed not to have won promotion back to League Two after two attempts but it is still early in the young manager’s career. He certainly had a better second season compared to his first. Hopefully Fergie can push on and win promotion back to the Scottish Football League. I’ll be using the in-game editor (cue gasps) to track Ferguson’s current ability as we progress in the save. Over two years you can see that he has improved by 5 points and will be hoping to continue his development as he aims to reach his 200 potential. If you liked this post, please do leave your feedback in the comments! Where do you think Ferguson will end up next? How long will he stay with East Stirlingshire before he moves on? This entry was posted in FM Experiments | Sir Alex Reborn, FM18 Guides, Experiments & Wonderkids, Football Manager 2018 and tagged alex ferguson, east stirlingshire, FM Experiments, fm18, football manager, scotland. Bookmark the permalink.